If you sell on Amazon without using FBA, it means you have to handle your own shipping. We are an online discounted shipping postage service provider and we can help your business. In the instance that your customers want to send products back to you for a refund or an exchange, Shipinar is ideal and will help add benefit to you as a seller. Customers will welcome the idea of sending back items with simplicity and at a discount and this can help you receive good feedback for providing great customer service. On the flip side, if you as a seller are currently dealing with your own shipping that is not using FBA rates, check us out as well. Our prices can go up to as much as 50% off regular market shipping rates and for sellers, there can be higher discounts based on frequency and volume of shipments. Shipinar lets you find the shipping cost and provides the rates of other major carriers in under a minute. 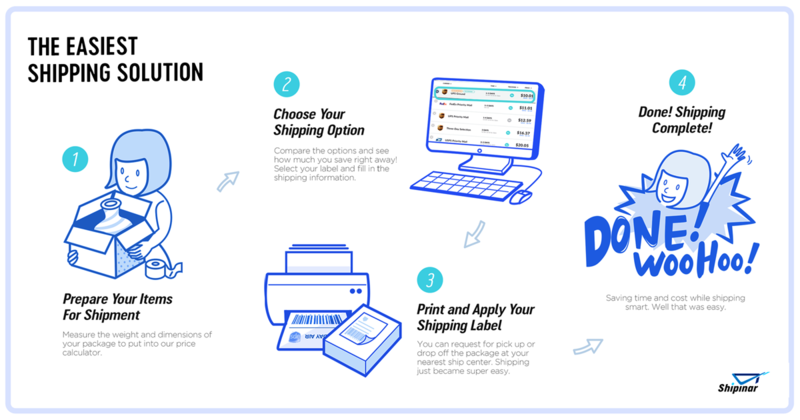 Sign up and packaging sending is very simple and you can ship items from your own home in under 5 minutes. You can also request to have your packages picked up. in the coupon code section when checking out.